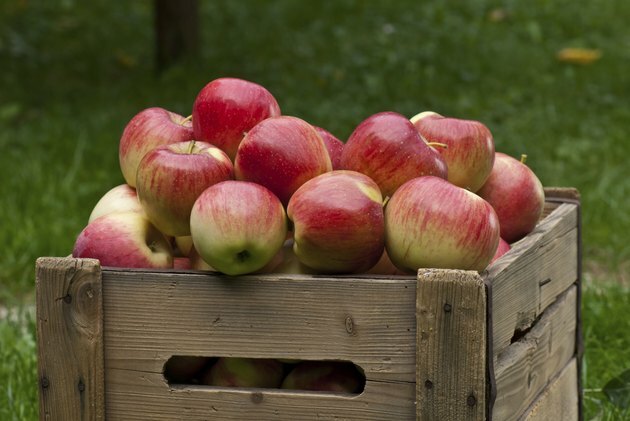 Whether your favorite is Red Delicious, Granny Smith, Cortland, Gala or another variety, apples are a long-standing staple of the American diet. Apples consist of approximately 85 percent water and 12 percent carbohydrates, including fruit sugars and fiber. Although different varieties have diverse flavors and textures, the carb count is roughly equivalent in apples of similar size. Carbohydrates are a group of chemicals that include simple sugars, starches and plant fiber. The FDA mandates that the "total carbohydrates" value listed in the nutrition facts for any food includes all three forms of dietary carbohydrates. A medium-size apple, roughly 3 inches in diameter, provides you with approximately 25 grams of total carbohydrates. A large apple, approximately 3 1/4 inches in diameter, contains nearly 31 grams of total carbohydrates. Since few people use a tape measure to determine the diameter of an apple, measure the width of your palm at home and estimate fruit size while shopping by comparing it to your palm. The natural sugars fructose and sucrose account for approximately 75 percent of the carbohydrates in apples. A large apple contains approximately 23 grams of sugar; a medium apple contains 19 grams. Although apples contain a significant amount of natural sugar, they are a low glycemic index food. This means that eating an apple is unlikely to cause a significant increase in your blood sugar level. Choosing low glycemic index foods to help control you blood sugar level is particularly important if you have diabetes mellitus or prediabetes. Fiber contributes to the total carbohydrate count in apples, although to a much lesser extent than sugars. A large apple provides you with approximately 5.4 grams of dietary fiber; a medium apple contains 4.4 grams. Apples contain both soluble and insoluble dietary fiber, each with significant health benefits. Insoluble fiber holds water in your intestines and helps keep your bowels moving regularly. Soluble fiber may help reduce your blood cholesterol level by trapping fats in your bowel and preventing them from being absorbed into your bloodstream. Lowering your blood cholesterol level may help reduce your risk of heart disease and stroke. Because much of the fiber, vitamins and minerals in apples are contained in the peel, you should eat both the flesh and the peel. Containing only minute amounts of protein and fat, virtually all of the calories in apples come from their carbohydrate content. A medium apple provides you with approximately 95 calories of energy; a large apple provides roughly 115 calories. An 8-ounce glass of apple juice has approximately the same number of calories and total carbohydrates as a large apple, but contains more sugar and less dietary fiber. Which is Healthier, an Apple or an Orange?